Above, the PBM Mariner one the most effective anti submarine weapon in the Atlantic. Radar operator reported indication 18 degrees to starboard, distance 20 miles. Ward, Second pilot, took the binoculars and started scanning. I looked at the sharp blip, on the pilot's radar scope. Approximately two minutes later Ward pulled my shoulder and pointed to starboard. He then took the controls. I took the glasses and picked the sub up after Ward had nosed over and turned to starboard 18 degrees. At first sighting it appeared to be either a large submarine or PC boat. The second pilot had increased the manifold pressure to 38 inches at 2350 RPM and we were beneath the cloud cover with an air speed of 140 indicated. I then took the controls and called Battle Stations for the crew. Apparently the sub hadn't seen us up to this point and about this time we definitely identified him as a submarine on heading approximately 270 at 8 to 10 knots speed. I had turned back to port in order to take advantage of thin cloud cover about six miles - bearing 2700T - from sub and to deliver attack from out of sun if time allowed. About this time however, we were sighted by the sub just as we were breaking clouds edge at six miles. He started firing his aft deck gun at this point and began a sharp turn to starboard, and noticeably increased his speed to I estimated 15 knots. This gave the impression, at this distance, that he was going to crash dive, so I immediately began the run. His after deck gun was firing continuously at 3 to 5 second intervals and the tracers from this gun at 3 miles were going by approximately 25 yards wide of the port wing. At this point I told the bow gunner to open fire, for disconcerting purposes more than effect, but his ears had become clogged on the descent and he didn't hear me. 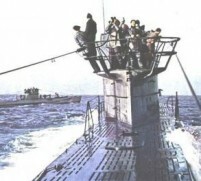 Other members of the crew, not occupied, attempted to get the word to him in the turret personally with the result that he became confused thinking that they were trying to relieve him and he never did fire. The sub was maneuvering as if to avoid drops or give me a beam run. I maneuvered so as to deliver attack as close to a keel run from stern as possible. The fire from sub at this point had become heavier with tracers from deck gun and, I believe, at least one machine gun. Tracers were to port and starboard of us. Past experience in firing free guns from carrier planes had taught me that half deflection shots were most difficult target, so I was skidding first left then right as violently as possible without spoiling the run. This I did without conscious effort as I was using the tactics before I realized it. 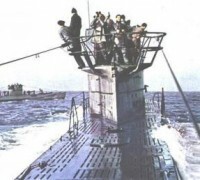 The U-boat made no attempt to dive. Bombs were released by the second pilot from 50 feet at 166 knots indicated while U-boat was in slight turn to starboard. Drop observed to straddle sub, two bombs striking deck with slight delay in detonation. Since none of my guns were firing my greatest desire was to get distance and evade more fire, so I remained low with a slight skidding turn to left; then, about 10 seconds later made steep turn to observe results and was surprised to see nothing but rising boils and brown stain on water. Came back over spot and 1 or 1-1/2 minutes after drop and saw spreading oil, brown discoloration, boiling bubbles, and about 15 to 20 survivors struggling in water. We immediately made preparations to drop life boats (rubber) to survivors. I slowed down and lowered flaps for this and boat was dropped approximately in their midst. Nickel Boat. 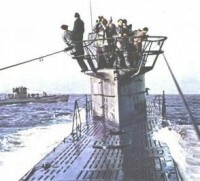 The PBM above sank U-513, the same U-boat which sent to the bottom the Royal Navy aircraft carrier Ark Royal off Gibraltar.